Bonds - Use an event or stage to schedule the start of future withdrawals from an onshore or offshore life fund – Have a question? To schedule planned withdrawals from bond, first consider the timing. You will need to have an event in the timeline to schedule the beginning of these withdrawals. A suitable event for this purpose may already be present in the timeline. 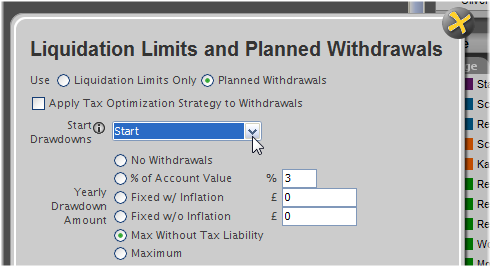 For example, if you want to begin withdrawals in the very first year of the plan, simply use the Start event. If withdrawals are to begin at the owner’s retirement, you might use his or her Retirement event. Otherwise, you will probably begin by adding an event to the timeline. Note: In most cases planned withdrawals are scheduled to begin using events; however, stages also could be used. A planned withdrawal could be scheduled to begin at the start of a given stage - e.g. at the start of the Retirement stage. 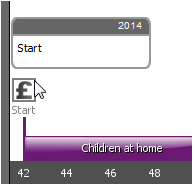 The overall timing of a bond (or for that matter, a discounted gift trust) is set on the Time panel to the right side of the Investments screen. Bonds require a start event (green dot) which tells the software if the bond is owned today, at the Start of the plan, or if it is to be purchased in the future, and an end event (red dot), which determines when in the future the bond will be fully encashed. 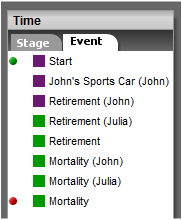 A bond will be fully encashed at the end event (red dot) or at the owner's death, whichever happens first. 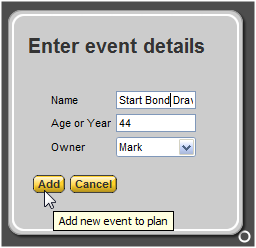 - Or find the Time panel located on the right side of any of the data entry screens (theInvestments screen for example), select the Event tab, click the New Event button in the bottom-right corner of the tab, and enter the name, age, and owner of the event.